One of our activities for our advent calendar was to make a Christmas craft. Every year we do something different, so this year I decided that we would make these cute dollar store snowmen decorations. First thing you need you need to do is fill your sock with sand. I experimented for a while on the best way to do this without making a huge mess. At the end of it all (and one big rice mess) I found that putting the sock into an empty cup/container and using a hair tie to secure the top of the sock to the outer lip of the container was the easiest. Once you have your sock secured you can start filling it up with rice. You want to go slowly as you fill it up and constantly check the amount of rice you have in the sock so you don't overfill each section. Once you've decided you have enough for the bottom of the snowman use your clear hair tie or rubber band and tie off that section so that none of the rice falls out. Once you've secured the section place the sock back into your container and fill up the second section. Continue filling and tying off sections until your sock has a snowman form. But make sure you leave some extra at the very top! Now that you have your basic snowman shape you can decorate him. Take your holiday sock and cut a section, making sure to not cut through the middle. You want to make sure that the piece you cut stays circular so you can put it on your snowman like a sweater. Once you've put the sweater on the middle section of the snowman you can give him a scarf. 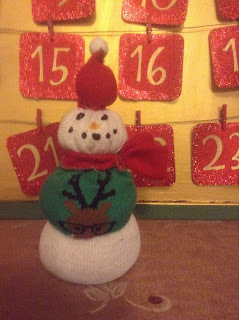 I cut the top elastic off of the holiday sock and placed it around the snowman's neck. I then took a clear hair tie and tied the duct piece close to the snowman's neck leaving a little "tail" of extra material. I then cut this material in half to give it the appearance of the ends of a scarf. Once I did all that I then cut the heal section of the holiday sock off and wrapped it around the extra bit of sock material I have left on the snowman. I used my hot glue to glue the heel section onto the top of the snowman for a hat. I then took the small pom pom and hot glued it to the top of the hat I made to finish the look of the beanie. Now that my snowman was all dressed I had to give him a face! I used black fabric paint to give him his eyes and mouth and an orange marker to draw a simple triangle in the center of his face for a carrot nose. And there you have it! A very simple and cute holiday decoration or gift that cost around $5 for all the supplies! Have fun! !